In the interests of learning from the masters, here are a few examples of evocative first sentences taken from a random scattering of works. As with yesterday’s assignment, consider how each sentence hooks your attention, declares stakes, identifies the mood and genre of the piece, and then take a look at the second list which presents the source of the work. When Miss Vine went to bed she was accompanied by her shadow thrown on the white marble wall. The fisherman loosened his knife in its scabbard. I am a medical man specializing in neurology and diseases of the brain. It was June 25th in the year 2999, and Hugh Grimes, the robot, worked feverishly to perfect the synthetic brain he had made after thousands of experiments, in his secret laboratory beneath the Tombs of the Kings near ancient Thebes. Given my predilections, and that these all survived not only the slushpile of the golden age of science fiction and fantasy – that would be the years before Damon Knight and Issac Asimov ruined the sci-fi culture for decades for those keeping score at home – but that they also survived decades of relative obscurity and passed into public domain where they were loved enough to have been posted in an easily searchable HTML format…it should be no surprise that they are all effective in their own way. Once you’ve had a chance to think about them for a minute, let’s look at the source, the who, and the why they work. 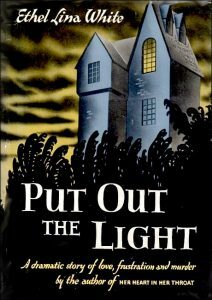 Put Out the Light, by Ethel Line White. You thought I’d start with an easy one? Miss White is a new name to me, one encountered while searching for easily cut-and-pasted HTML versions of first sentences. She wrote primarily Weird Tales style horror, but I can’t say more than that until I’ve read more of her works. The simple act of going to bed, pursued by one’s own shadow, becomes oddly sinister when she describes it this way. It’s a nice lead in, even if it does suffer a bit from the “Name First” trope that generally turns me off. Anybody out there have any experience with Miss Ethel? How does her work hold up? The Devil in Iron, by Robert E. Howard. Yes, this is a Conan story, and the fisherman is the first victim of a supernatural terror. Note the implied menace that draws the reader into the next sentence. Fisherman are tough old buzzards, so if this guy is nervous enough to check his knife and keep it ready, you can bet what happens next will be bloody. I’ve never read this work – that needs to be corrected. Tarzan of the Apes, by Edgar Rice Burroughs. This one takes a bit to work through. One the one hand, it’s a great way of hooking the reader, as it implies the fantastic tale to follow not only happened in the real world, but that no one is supposed to know about it. It hooks the reader by inviting him to join in a conspiracy of knowledge, and thereby works to stroke the reader’s ego with the faint hint of forbidden knowledge. It also serves as a framing device for the action that follows. We’re not reading from the point of view of an omniscient narrator, but reading a third hand tale passed down from one co-conspirator to the next! That’s a lot to pack into such a short sentence. Burn, Witch, Burn! by A. Merritt. Hey, they can’t all be winners. This sentence introduces the main character as an exceptionally intelligent protagonist, one not particularly squeamish, and perhaps one who is ultimately rational and given to science rather than the fantastic notions of magic and the occult. It isn’t particularly gripping, but it does alert the reader to the first person viewpoint of the story that follows. The Iron World, by Otis Adelbert Kline. Holy cats, now that’s how you start a story that begs to be read. It’s a mouthful, to be sure, and it throws ideas at the reader with machine gun ruthlessness, almost daring one to rush ahead before one’s thoughts have processed that we’re in the distant future when a robot might strive to perfect a fake brain, and do so beneath the ancient tombs that litter the deserts surrounding Egypt. And why does a brilliant robot like this have the prosaic name of Hugh Grimes? How can you not keep reading after an introduction like that?